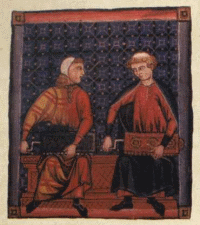 The simfony is shaped like a small musical wardrobe, played sitting down, and it was popular in European courts in the 13th and 14th centuries (as in the picture from the Cantigas de Santa Maria, a royal Spanish music collection from c.1270). It consists of three strings, a wheel with a handle to turn it (in effect, a circular bow), and a wooden box to house it all. Of the three strings, the highest (c) is the chanterelle or singing string to play the melody, the lowest (C) is the bass drone, and between them is another drone at an interval of a 5th above the bass (G), called the trompette. Because the wheel is constantly turning – and therefore sound is continuous – and only one of the three strings plays the melody, the simfony has a distinctive drone sound, like bagpipes. The melody string, the chanterelle, is played by a series of keys called tangents. If the wheel does the equivalent job of a fiddler’s right hand bow, the tangents do the job of the fiddler’s left hand fingers. The tangents are on the bottom of the instrument and therefore not sprung: once the note is played and the player lets go, gravity lets the tangent fall. The simfony is diatonic, that is to say it only has natural notes (the white notes on a piano), no sharps or flats (no black notes). The distinctive sound of medieval music is due to its modes giving a very different soundworld to today’s music. Medieval modes had, in principle, almost exclusively natural notes, like playing only the white keys on a keyboard. There were 4 natural scales starting and ending on D (dorian), E (phrygian), F (lydian) and G (mixolydian), the authentic modes; and 4 more that began and ended on different degrees, the plagal modes: A/D (hypodorian), B/E (hypophrygian), C/F (hypolydian) and D/G (hypomixolydian). Each of the 8 modes have their own tenor or reciting note, being a dominant note in the melody; and typical musical figures or clusters of notes. Therefore a mode works in a very different way to a modern scale or key signature. In other words, the diatonic simfony fitted the music of the day perfectly well. Developments in European music in the 14th century and beyond, just on the cusp of the renaissance, marked the end of the simfony. The growth of harmony and the rise of chord sequences, together with the invention of the modern key signature with fixed sharps and flats, made the simfony obsolete, to be replaced comprehensively by the hurdy gurdy, which was built with an extra row of sharp and flat tangents for the new ‘modern’ music (and with an additional buzzing bridge to create rhythm). However, whereas the simfony was a court instrument, the hurdy gurdy slipped down the class system to become an instrument for buskers and shepherds. Since there was no standard spelling in the middle ages, simfony can also be spelt in a variety of other ways: symfony, simfonie, sinfonie, or symphony.